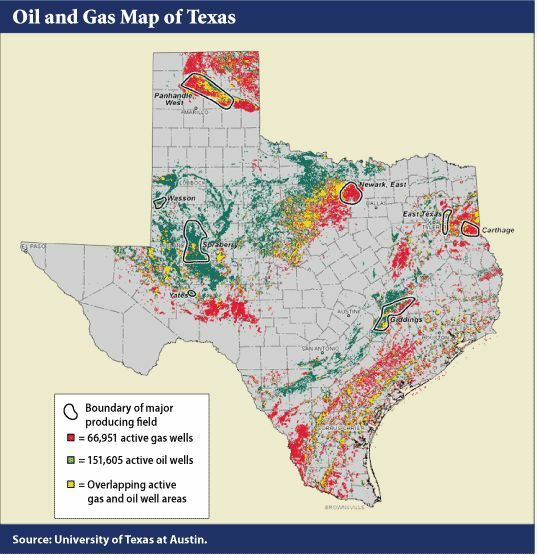 Texas oil wells produced more than 1.54 billion barrels of crude in 2018, topping the previous record of 1.28 billion barrels set in 1973, TIPRO reported in its annual "State of Energy Report.” Natural gas production also grew, reaching 8.8 trillion cubic feet (tcf) last year. In 2017, Texas also came close to beating the 1973 oil output record, pumping 1.26 billion barrels of oil. To put Texas oil production in perspective, if it were a country, it would be the world's third oil producer sometime this year, behind only Russia and Saudi Arabia, HSBC said in a report. The main engine of Texas oil output is the Permian basin that spans West Texas and southeastern New Mexico and is one of the most prolific oil and gas producing regions in the U.S. The Permian Basin is approximately 250 miles wide and 300 miles long, across West Texas and southeastern New Mexico. It encompasses several sub-basins, including the Delaware Basin and the Midland Basin. Record-breaking U.S. oil production is expected to continue for decades, driven largely by the Permian Basin, the U.S. Energy Information Administration (EIA) said in its Annual Energy Outlook two weeks ago. In the outlook's reference case, the EIA forecasts U.S. oil output, which averaged 10.93 million b/d in 2018, to climb to nearly 15 million b/d by 2027 before flattening out and falling below 12 million b/d by 2050. Shale production in the Lower 48 states will account for nearly 70 percent of domestic production over the next three decades, according to the report. The majority of the growth will take place in the Permian, according to Meg Coleman, leader of EIA's exploration and production team. The EIA also projected that the U.S. will become a net energy exporter in 2020 and remain so through at least 2050, due largely to a rapid growth of domestic crude, gas and natural gas liquids (NGLs) output and a slowdown in US consumption growth. U.S. oil production has changed global oil markets over the last several years, catching both global oil players and Russia and a Saudi-led OPEC off-guard. U.S. production was largely responsible for an oil glut in late 2014 that saw Saudi Arabia change course and instead of cutting back production to support prices that were its standard policy for decades, it actually ramped up production to not only drive U.S. shale producers out of business but to guard its market share. However, the plan backfired, almost driving the kingdom into a financial tailspin, and saw oil prices plunge from around $100 per barrel in mid-2014 to just under $30 per barrel in Jan. 2016. In essence, it was U.S oil output that forced Saudi Arabia to reach out to Russia and other non-OPEC players and form the so-called OPEC+ group of producers to try to take back control of global oil markets. Going forward, U.S. oil production will still cause havoc for OPEC+ as the group makes good on its recent deal to trim oil output. Other factors, including the loss of both Iranian and Venezuelan barrels, the outcome of U.S.-China trade talks, and economic growth also come into play. Finally, what Saudi Arabia could for decades, play the part of global oil markets swing producer, it now has to do with Russian help and at the end of the day, U.S. production, albeit driven by Texas production, is the reason why.